Buy works – Mokrov Nickolay Alekseevich | (1926, Gorky Region -1996, Vladimir). 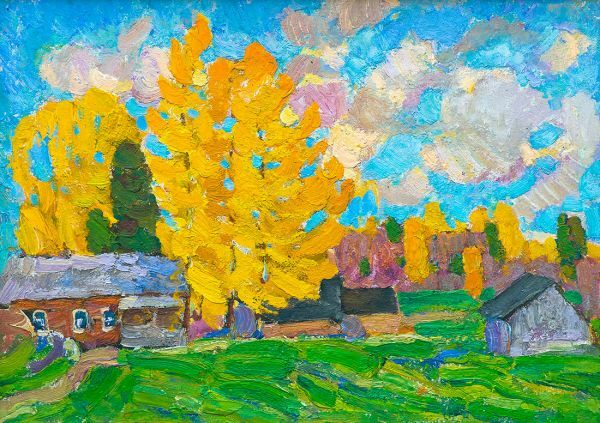 Mokrov Nickolay Alekseevich (1926, Gorky Region -1996, Vladimir). An honoured artist of the Russian Federation. Studied at Vladimirsky College of Arts under N.F. Zakharov, S.S. Preobrazhensky and N.P. Sychev (1948-1951). Worked as a graphic designer for Gorkovsky Car Factory (1945-1947), at "Khudozhestvenny" Cinema hall in Vladimir and for a tractor plant. Since 1957 became a regular exhibitor of regional, zonal republican and All-Union exhibitions, and selling exhibitions, organized by The Art Show for export of USSR State Art Collection, in the USA, France, Italy, Germany, Austria, Belgium, Holland, Switzerland, Finland, Canada, Japan, Lebanon. A member of artists union since 1967. The artist's personal exhibitions were held in Vladimir in 1983 and 1986. His works are kept in museums of Vladimir and other regional museums. 140000 - 160000 rub. 140000 - 160000 rub. 140000 - 150000 rub. 140000 - 150000 rub.